PF2 in-line or manifold mount pressure housing max recommended operating 4000 psi / 207 bar. Ideal for protecting servo valves and other low flow sensitive components. Available in bypass or non-bypass configuration. 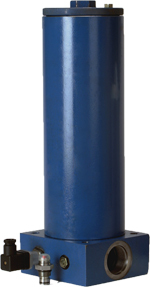 The PF4 high pressure filter with max recommended operating pressure 5000 psi / 350 bar features Hy-Pro DFE rated coreless filter elements or optional HF4 automotive specification. With three available length configurations PF4 can handle a wide range of flow rates and is ideal for HPU pump discharge applications. 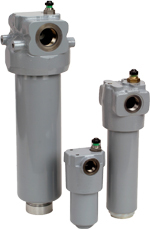 PFH high pressure filter series with max operating 8700 psi / 615 bar is available in four sizes to handle applications from pilot actuator valves to high flow pump discharge. Rugged steel construction and DFE rated filter elements provide lower ISO codes for the toughest industrial and mobile installations. The PFHB bi-directional filter filters fluids in both directions and is not another high pressure that filters in one direction and has reverse flow check or bypass valve built into the housing. Max recommended operating pressure 6200 psi / 450 bar makes the PFHB ideal for protecting large cylinders or hydrostatic loop circuits. In large cylinder applications fluid is typically trapped in the lines and never makes it back to the reservoir. With the PFHB in-line between cylinder and reservoir this can go from one of the dirtiest systems in a plant to one of the cleanest ensuring cylinder reliability. Filter housing extension tubes & element upgrades for Westinghouse EHC system hydraulic power unit pump discharge filters (2 per pump). 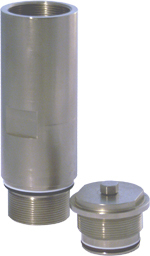 Housing extension + longer element (double surface area) prevents high element Dp pressure problems. Upgrade 10-15m element to 3m for cleaner fluid and increased reliability of hydraulic actuator servo valves.